Small - $39.99 Medium - $39.99 Large - $39.99 Only 6 left! Because, if your child wants to join Team Rocket, they're likely to get themselves into a spot of trouble. What else could it be called when they're off to steal and exploit Pokemon and take over the world? Many Pokemon trainers don't support that... hence the trouble your kid is likely to get into. Team Rocket has some of the most notorious Pokemon trainers, including Jessie. This hot-headed Pokemon catcher is known for her long sultry hair and quick temper. Especially if someone dares to mess with the do. Big no-no. She'll also get mad if her Pokemon-capturing schemes don'tgo according to plan. So... yeah. She gets mad a lot. Other than that, she's a bit of a drama queen, but she's clearly not one to mess with. With her snake and poison Pokemon (and assuming James and Meowth don't get in the way), she is one dangerous trainer. So if your kid is feeling a bit diabolical (and devious), we've got the perfect costume for them. 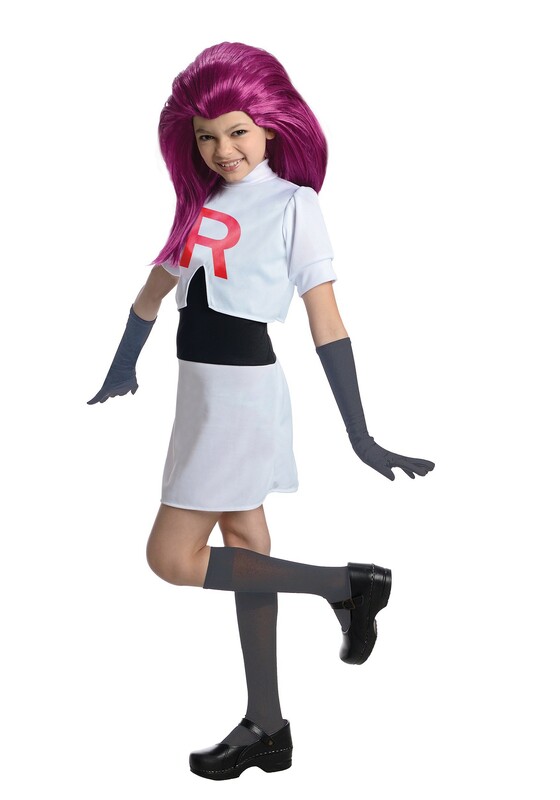 Our Child Jessie Team Rocket Costume is styled to look just like Jessie with a skirt, black undershirt, and jacket crop-top with the iconic Team Rocket "R" plastered on the front. It also comes with the gloves and knee socks, bodacious hairdo sold separately. Now, go catch 'em all!